Fixed two bugs in EpisodeCheck 1.7.1. - Episode title could not be changed. ">>> Inserted Episode <<<" and you were supposed to be able to change that to the appropriate episode title. Now episode title is always editable. PS. The reason that you see no images above in this thread (or in any other of my threads) is that PostImage for some reason had to change the address from PostImage.org to PostImage.cc. "Please update codes embedded in your websites" they say. Yeah, like that's possible here. Thanks for nothing PostImage! EpisodeCheck + TmdbTvShowCheck = True! Sorry that the video is a bit fuzzy, bit it shows how quick and easy it is to import episode data into EpisodeCheck with the help of TmdbTvShowCheck. 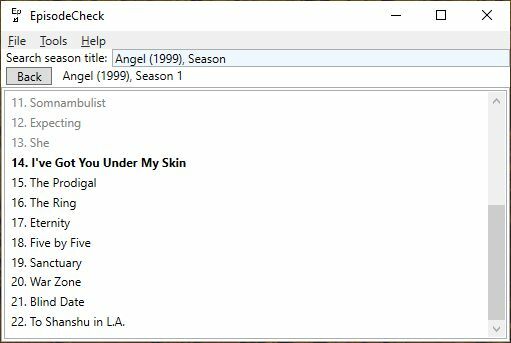 Initially I had planned to include the functionality for getting episode data directly into EpisodeCheck, but then I realized it would be much easier to just make the two programs work together. You'll need to update both programs. EpisodeCheck 1.8.0 and TmdbTvShowCheck 1.4.0. A couple of changes to make EpisodeCheck just a little bit more user friendly. If you have several shows that you are watching, switching between shows will now be a little easier. Also, when you are watching a show and want to mark an episode as watched, just hitting F2 will mark the first unwatched episode in the list as watched. No need to fiddle with the mouse. Ctrl-F2 will mark the last watched episode in the list as unwatched. Just in case you set something as watched by mistake. I don't like laptops. Never did. Got through my whole IT career with just a desktop PC. As far as I know I was the only person in the whole company who never had a laptop. On a few occasion I had used someone elses laptop. Never warmed to it. At home, I used to get by very well with just a desktop PC in my study and an iPad in my living room (where I watched my movies). 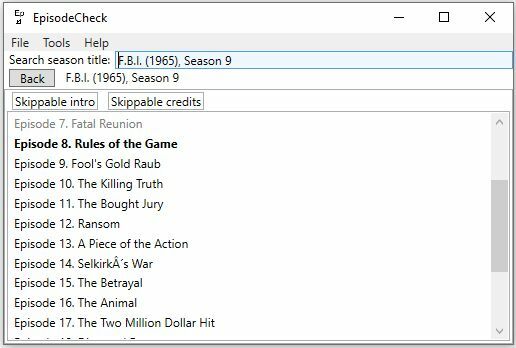 When I developed EpisodeCheck, at first I used SplashTop to access my PC from the iPad, in order to keep track of my TV shows. But that was kind of klunky. So I finally broke down and bought an HP laptop. I thought that it would be good to have a second, "virgin" PC to test my programs on. And it would make it easier to use EpisodeCheck. I did, however, find that I still hated fiddling with the trackpad to move the mouse pointer. So that's the main reason that I wanted to make EpisodeCheck more keyboard friendly. Will this trackpad aversion lead to more of my programs being updated to be more keyboard friendly? Perhaps. I still use my programs mostly on the desktop, but who knows. If anyone feels that any of my programs could be made more user firendly, don't hesitate to ask! 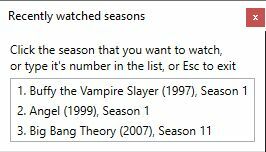 Forgot to mention that the watched season data is collected separately from the watched episode data, so when you start using 1.9 it will initially not show any recently watched seasons. I found that while the difference between watched and unwatched episodes was quite clear on my desktop monitor, on my laptop it was a whole lot less obvious, so I decided to make the next unwatched episode be shown in bold. Why do I always do it the hard way? Some TV shows start with an intro that's just short snippets of the show to come. Sort of a trailer to get viewers interested so they don't switch to another channel. Useless if you're watching the show on DVD (or BD), and actually "spoilerous", if you know what I mean. I like to skip that part if I can. The opening credits also get pretty repetitious after a while. I like to skip those too, if I can. The key here is "if I can". Does skipping to the next chapter take me to the actual start of the show? My first thought was to just make it possible to display just exactly those two tags. But then that little developer angel on my shoulder whispered in my ear "Other users may want to use other tags". Shuddup Jiminy! This is my program and I do with it what I need and want. But of course that idea had infested my brain like a little parasite, and the only way to get rid of it was to actually develop the program so that these tags could be fully configurable. So, now that's done. And you can see the result in EpisodeCheck 1.10.0. I'm not going to tell you more than that. The whole thing is clearly explained in the help file, in the chapter named Season tags. Go find out! 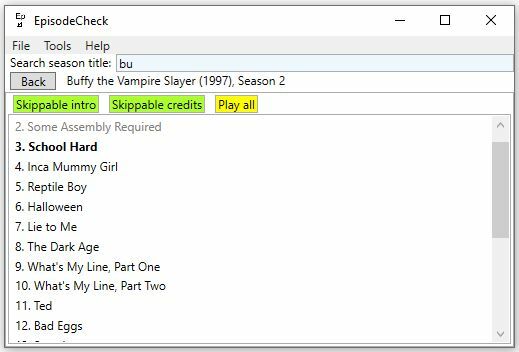 I keep toying with EpisodeCheck, adding features that nobody asked for. 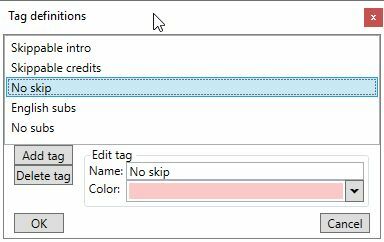 When you edit a tag you can also select a background color for it. Best not select a very dark color, or the text will be hard to read. So, it could end up looking something like this. Or leave them white if you don't like color. What's next? I don't know. Anyone for singing and dancing tags? Ok, no, just kidding! Really! He he, are you a fan of Buffy in general, or Juliet Landau in particular, Karsten? More so of James Masters. After watching him on Buffy and Smallville, last year I listened to his reading of the Dresden Files audio books (15 books to date). He was a constant companion over months. Ah, James Marsters. Yes, he was good in Buffy. I haven't seen Smallville. Maybe if it was available on streaming, but I hesitate getting more big shows on DVD. I still have unfinished shows from 15+ years ago. Audio books? Ah, good for travelling, I guess, but for a homebody with 700+ movies in my unwatched pile? No, I guess not.